The canines at Dogwood Acres Pet Retreat of Davidsonville have a new Caring Canines program to bark about with seven certified pet therapy teams to enrich the lives of those in the community who are suffering. The pet retreat has partnered with three area nonprofits including Hospice of the Chesapeake, where they are forming a relationship between the trained pets and children in the Chesapeake Kids program and also the nonprofit’s hospice patients. This partnership offers a dual purpose by providing a peaceful presence for hospice patients as well as comforting support for children living with the grief of losing a loved one. “The human animal bond is unique and the benefits of pet therapy are endless. We are honored to partner with Hospice of the Chesapeake as the ultimate goal for the Caring Canines program is to share the gift of pet therapy with a wide variety of individuals whose quality of life will be enhanced by the comfort and presence of a loving furry friend,” said Audrey Reichardt, who owns Dogwood Acres with her husband Kurt Reichardt. The volunteer pet therapy teams are a welcome addition to Hospice of the Chesapeake’s Healing Arts program. “Caring Canines and the ‘furry love’ are a great addition to our Healing Arts Program. Patients just light up when they see a dog and start sharing stories about their beloved pets,” said Johanna Boyer, Healing Arts Coordinator, Hospice of the Chesapeake. 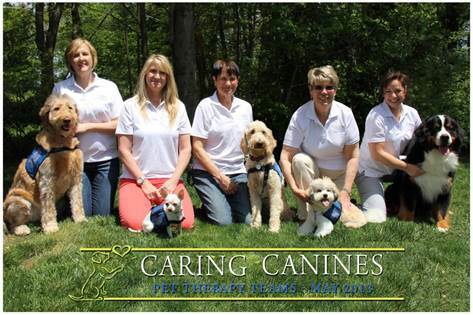 If you are interested in the Caring Canines program or pet therapy certification, email [email protected]. Dogwood Acres also hosts a pet loss workshop in conjunction with the Chesapeake Life Center, a program service of Hospice of the Chesapeake. For more information, email [email protected] or visit www.chesapeakelifecenter.org.